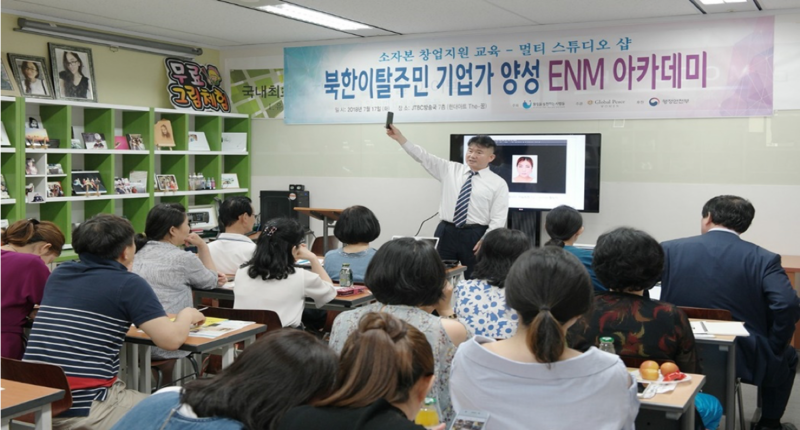 A North Korean defector contemplated his hopes and dreams as he and his wife attended a class to learn about photography, 3D printing technology, oil painting on canvas, and photoshop, eagerly watching Mr. Joo-wan Kim, class instructor and President of Hyundai Art The-Dream, who pioneered his digital art business to combine photography and information technology. 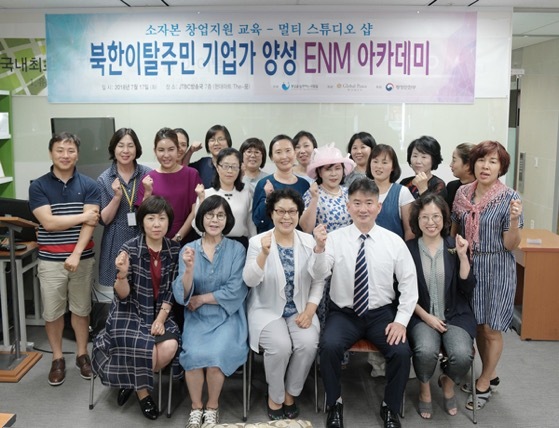 Global Peace Foundation (GPF), Action for Korea United (AKU) and the Ministry of Interior and Safety collaborated to offer this class for North Korean defectors in July 2018 as part of the ongoing program North Korean defectors entrepreneurship training ENM (Educating + Networking + Mentoring) – Small capital start-up support training. North Korean defectors have dreams of starting their own businesses in South Korea but need opportunities to develop the knowledge and skills required to compete in the labor market. This entrepreneurial training program provides them exposure to various industries by going on field trips to businesses, networking opportunities, technical skills training for specific industries, and mentoring. Mr. Kim pointed out to his class of 30 North Korean defectors that most people in the modern era have cell phones full of pictures but no place to print them. To fill this need, he founded his multi-studio start-up business that easily prints photos from mobile phones, which can be placed in frames, tiles, and mugs. His business also uses 3D printing technology. The path to starting a business is not easy for any individual and even more so for North Korean defectors. They have travelled great distances and faced unimaginable obstacles. Yet, the challenges have not stopped them from dreaming of a brighter future. North Korean defectors have dreams of utilizing their creativity and unique talents and abilities to start their own businesses and become contributing members of society. They also dream about the peaceful reunification of their divided homeland. The division of the Korean peninsula is a human tragedy in which families have remain separated in the North and South for decades. North Korean defectors dream of one day reuniting with their loved ones – their grandparents, parents, spouses, siblings, and children. The One Korea global campaign is reawakening the dream of a unified Korea in the hearts of Koreans living in the North, South and global diaspora, and articulating a unique vision for the nation that remains true to Korean heritage and identity. The ancient Korean philosophy Hongik Ignan, to broadly benefit humanity, is a universal ideal guiding the vision for a unified nation where all Koreans can live in prosperity, freedom, and dignity. Keep up with the latest on peaceful reunification through grassroots projects from Global Peace Foundation and find out how you can be a part of the Korean Dream.